I am having a tough week this week because my mom had to have surgery to remove a questionable growth discovered after a follow-up breast MRI last month. Earlier this year she had a mammogram and subsequently a biopsy of both breasts where they tagged areas of concern. When she did a follow-up breast MRI last month, the results showed that one of the areas tagged had grown enough that it was time to have it removed. That resulted in a whole host of additional doctor appointments and labwork work to get everything in order for the surgery. Add to that, just prior to the breast MRI, she slipped in the bathroom and twisted her left knee so hard that it resulted in a tear and a small line fracture. She had to have the knee drained but because she is on blood-thinning medication, she cannot take the normal aspirin based medication to reduce the swelling which has hampered her healing as quickly as she could have had she been able to take those type of medications. With the aid of a walking stick, she has had to struggle with the pain of a messed up knee while going to all these appointments for this procedure. I, meanwhile, have been juggling coordinating her care, my job and a million other life tasks as best I can. The days are long and there are no breaks! And yet, there are silver linings in the clouds. My mother’s knee is getting better. 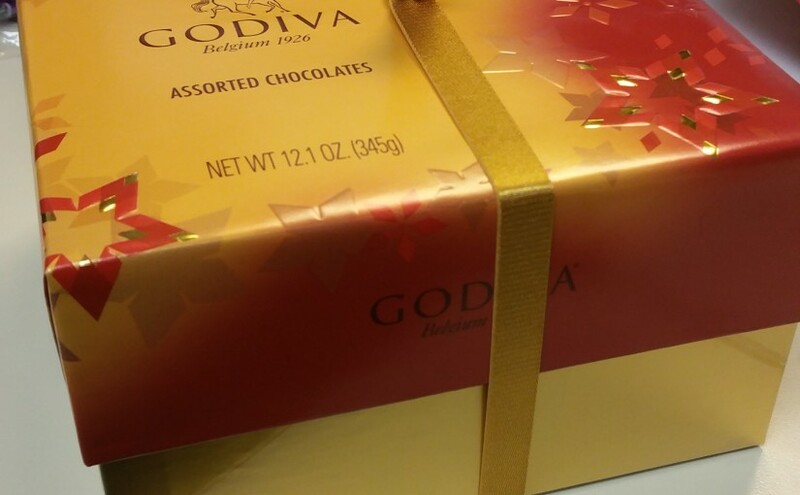 Yesterday at work, I got a surprise gift from the VP of our department of a big box of Godiva chocolates. I was so happy and so pleased that I posted a photo about it on my Instagram. Today was my mom’s surgery. Everything went well and she is resting at home comfortably. In a week we get back the results of the biopsy but the outlook is very positive good because even if there results are not good, the doctor believes we have caught everything very early. And today, Godiva contacted me on Instagram to let me know they loved my photo and wanted to feature it on the site and social media channels! So a tough week has indeed turned sweet! ***Breast cancer awareness is important! Make sure you have regular check-ups.